Lerch's Donuts are one of those things I crave all the time. Growing up in Wooster, OH it's almost like a tradition to go to the Wayne County Fair every year and wait in line for Lerch's Donuts. Truth be told, Lerch's is one of the only reasons I go to the fair. I was so excited to do photos for Lerch's Donuts, it was so much fun to learn more & see how they make the donuts. (oh, and the free samples are the best). Don't worry though, if you are passing by the area you can always find a Lerch's trailer open somewhere -- check out their trailer finder HERE ! Lerch's Donuts was founded by John Lerch, Sr in 1932! They have perfected the art of making cake donuts that aren't greasy. (Exactly why I love them) In 1934 Lerch's Donuts became a vendor at the Wayne County Fair, quickly becoming the #1 vendor there! 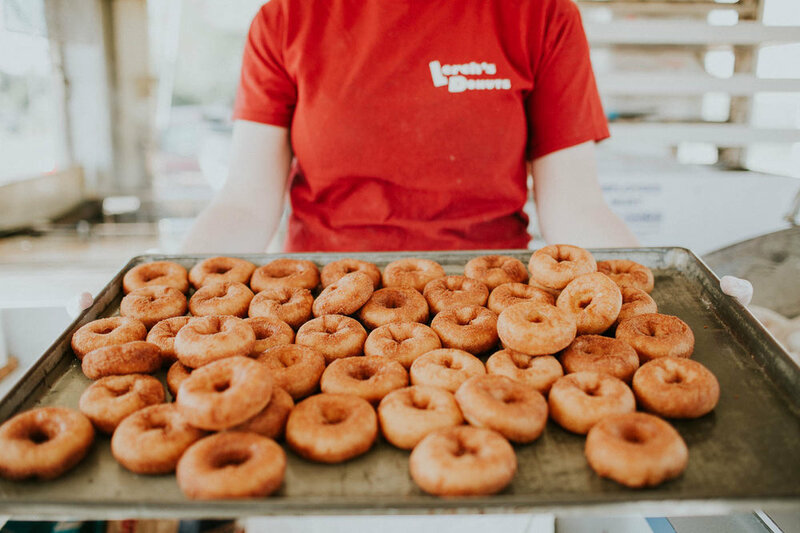 Many things have changed at Lerch's but the recipe to their amazing cake donuts has always stayed the same.